Madame Xanadu was created by David Michelinie, Val Mayerik and Michael Kaluta in February 1978, and made her first appearance in Doorway to Nightmare #1. Madame Xanadu was the main star of this series of mystery comics, with the series paving the way for the beginnings of DC’s Vertigo line of comic books. 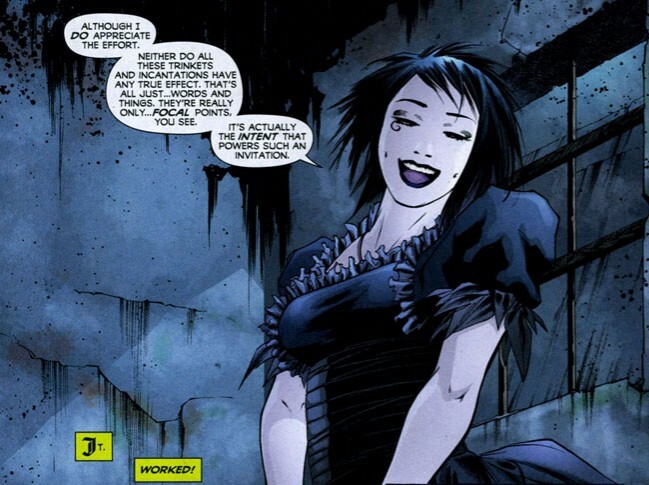 Vertigo is an imprint of DC, originally created to publish stories that didn’t meet the strict guidelines set down by the Comics Code Authority, which enabled DC to have more graphic and explicit content in the stories than was possible in their main superhero line of comic books. It is believed that Madame Xanadu’s alter ego is that of Nimue the Sorceress, ruler of Avalon from Arthurian legend, also known as the Lady of the Lake. 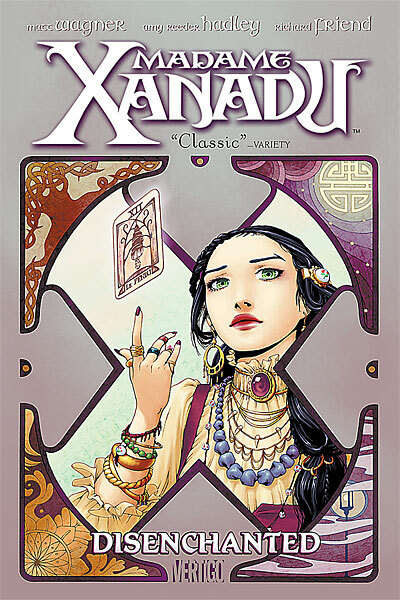 Disenchanted is the trade paperback collection of issues 1-10 of Madame Xanadu’s comic series, released in 2009. 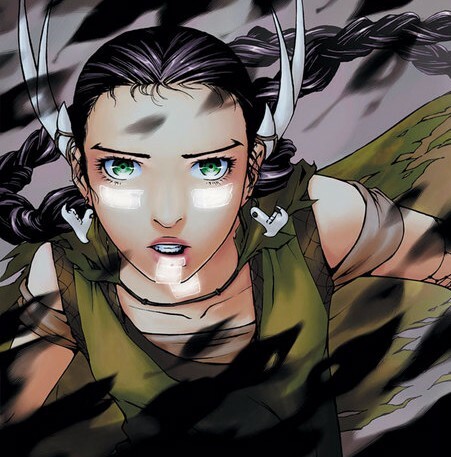 Written by Grendel creator Matt Wagner, and drawn by Amy Reeder Hadley and Richard Friend. Madame Xanadu is one of world’s most mysterious and enigmatic magicians, for centuries she has aided both the powerful and powerless alike when threatened by supernatural forces. The esoteric character originally learnt her craft through Merlin the legendary wizard from King Arthur’s court. Wagner and Hadley’s spellbinding tale takes us on a captivating journey through the annals of time alongside Xanadu as she meets and aids illustrious figures from the past, from reading the fortune of Marie Antoinette, through serving in court as a precognitive for Ghengis Kahn, and even cheating Death herself in a game of cards. Amy Reeder Hadley’s visuals are gorgeous throughout. Wagner’s story makes for compelling reading as we follow Nimue through key points in human history. For all her power though, Nimue is an emotional and empathetic character, who is ultimately just trying to find her place in the world. Wagner brings much pathos and poignancy to Nimue, so much so that you cannot help but form a real emotional attachment to the character, which in no small part is also down to the magnificent visuals provided by the very talented Amy Reeder Hadley. Hadley is an extremely versatile artist and this shines through in a story that takes place throughout history, meaning that Hadley had to draw everything from medieval castles, through grimy 1800’s London and beyond into the early 20th century, Hadley’s consummate artistic talent accomplishes this with ease. Madame Xanadu: Disenchanted comes highly recommended, introducing you to a lesser known DC character, who is an enigmatic and powerful mystic, yet at times a very human and tragic character, masterfully realised by Wagner and Hadley, who provide for us some of their greatest ever work. Precinct1313 Rating: 5 Metaphysical Mystics out of 5. It’s no dream…the Sandman is coming! 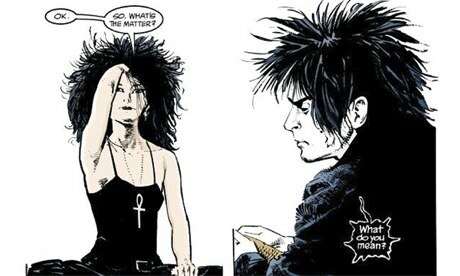 Well, after close to twenty years of failed attempts at bringing the Neil Gaiman created character – Sandman to the screen, it looks like he will finally grace our cinemas with his dream-like presence. Warner Bros have announced that actor Joseph Gordon-Levitt has been brought on as a producer on the planned movie of the endless. He will be joining writers Neil Gaiman and David Goyer on the proposed project. 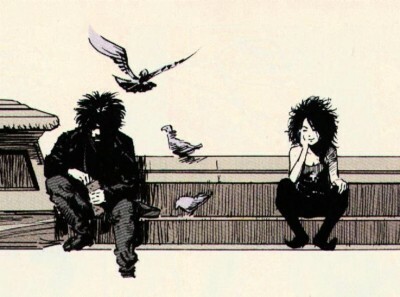 Sandman was created by Neil Gaiman, with the debut issue releasing November 1988, the series initial run was 75 issues long, with Gaiman writing each and every comic. 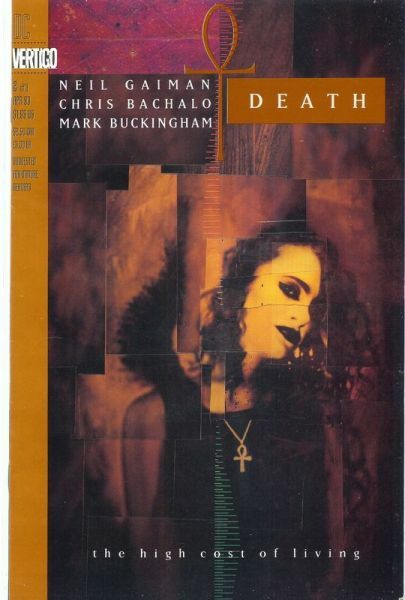 Various artists portrayed the Endless throughout its run, though Dave McKean stayed with the title to draw every one of its 75 covers. 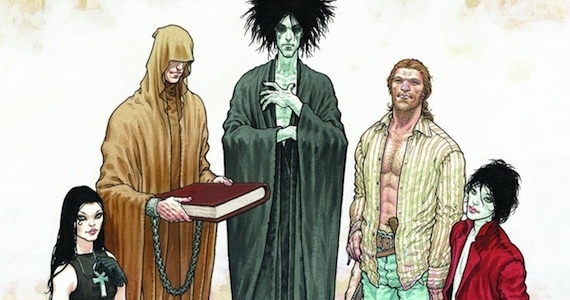 The Sandman – also known as Dream and Morpheus is one of the seven ‘Endless’, which also include his extended family of – Death (our personal favourite of the Endless), Destiny, Desire, Despair, Delirium and Destruction. No date has been set, but just the fact that one of the greatest comic series of all time is getting a film release is good enough for us.